Hearts are fun for Valentine's Day, but they work year-round as well! 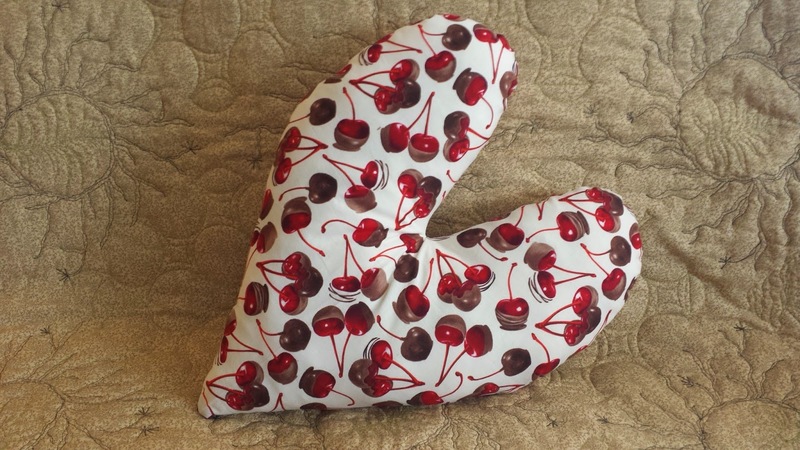 Try out this quick and easy multi-purpose pillow...maybe while munching on a few candy conversation hearts to get you in the right mood! 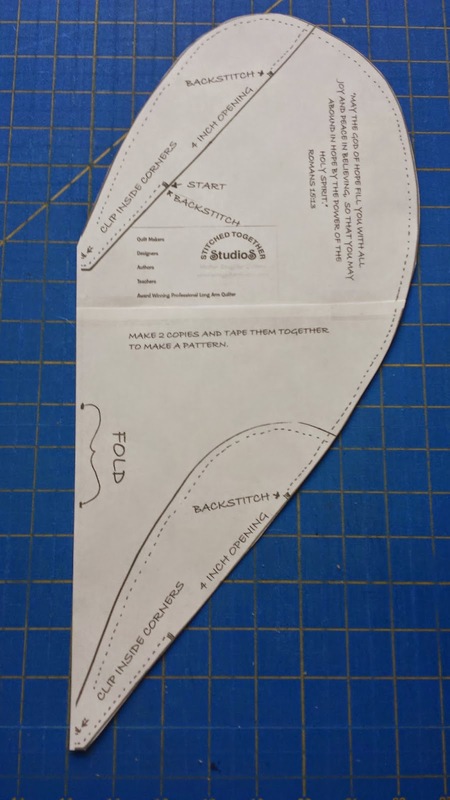 Today Linda Leathersich and Stephanie Sheridan from Stitched Together Studios is sharing a heart pillow pattern. 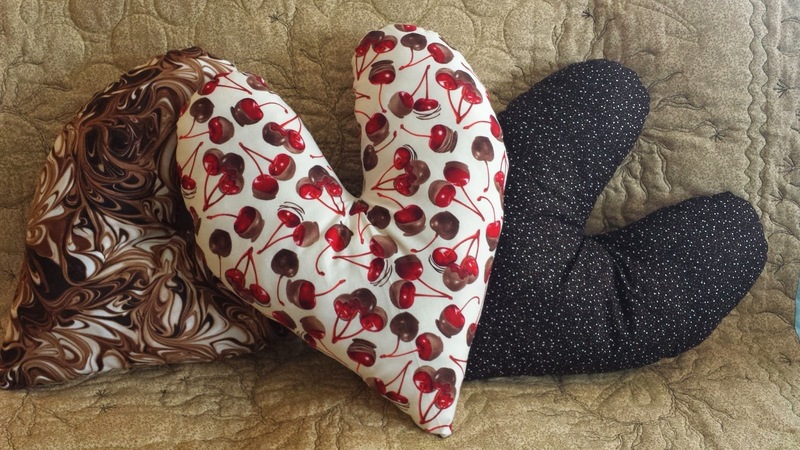 Yes, they'd be fun for your couch or bed to celebrate the season of love, but these pillows also have another purpose. The elongated design is intended especially for those who have had breast cancer surgery. The shape fits comfortably under the arm and functions to cushion the chest, especially against a seat belt. This pattern is copyright free – please share with as many people as you would like! 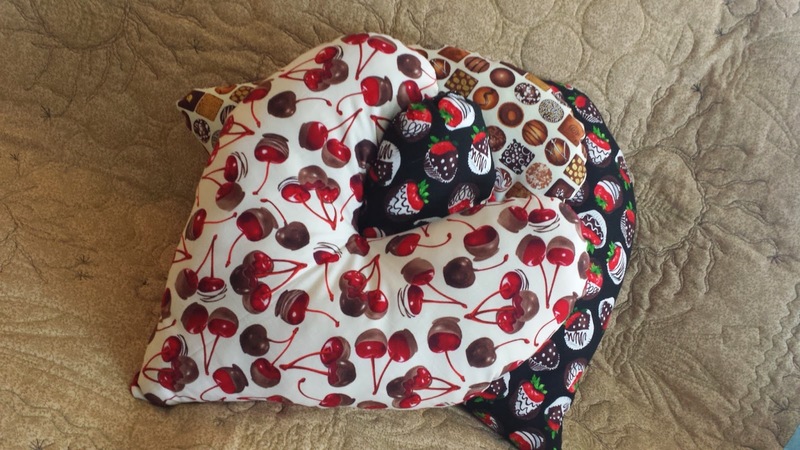 Stephanie used the delectable Chocoholic collection by Maria Kalinowski for Kanvas--chocolate covered cherries and strawberries, row upon row of chocolate candies, rich chocolate swirls...but all calorie-free! 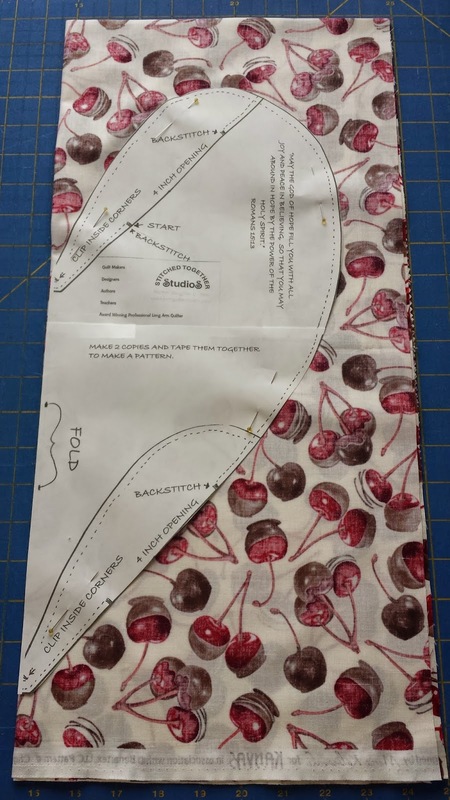 Download and print the pattern pages here and here. 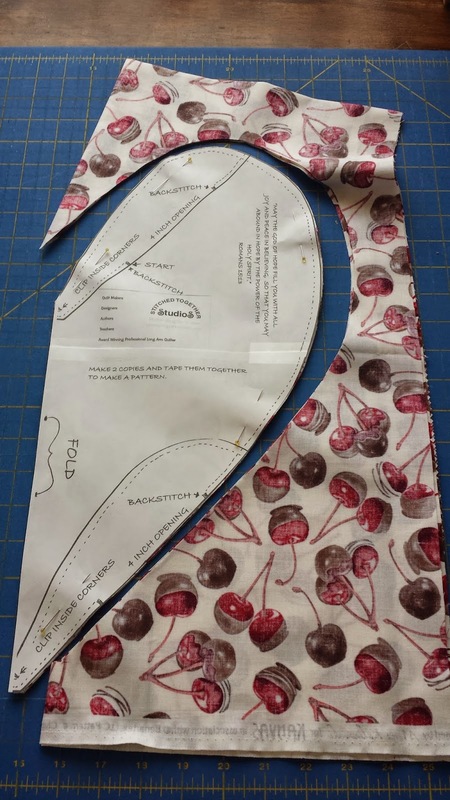 Start by printing off the pattern, printing two copies of page 2. Tape the pages together as directed to create heart pattern, them cut out along the solid line. 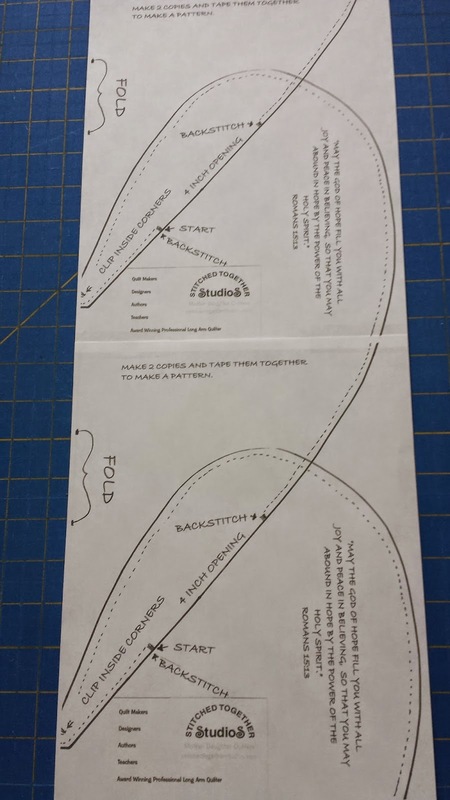 Step 2: Fold again to create a 9” X 21” rectangle and press. Lay on cutting mat with fold at top and left. 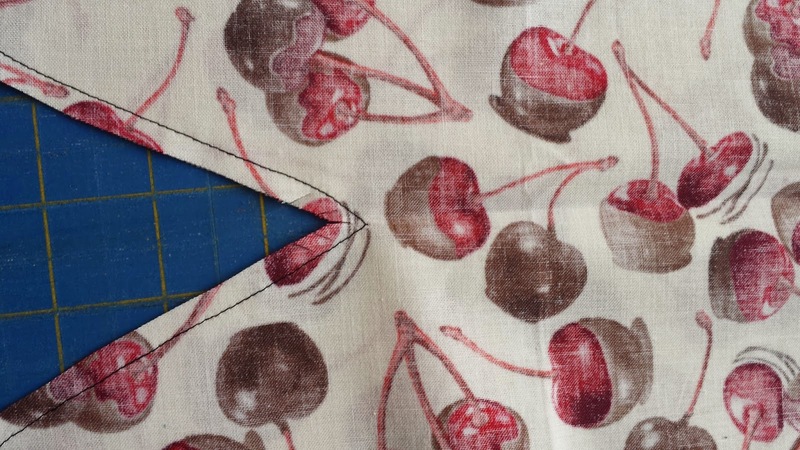 Step 3: Place the pattern on the fabric with the fold correctly placed and pin. Step 4: Cut out the heart on the line. Step 5: Open the fabric heart and press. Step 7. 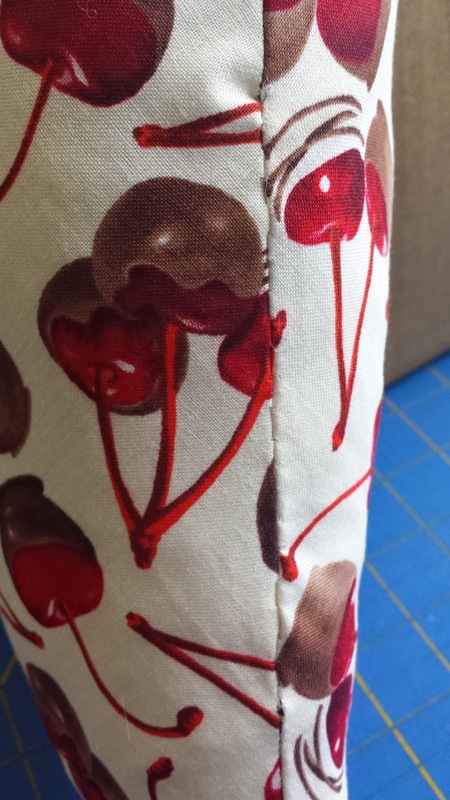 Starting at the “start” mark – stitch all the way around the pillow using a 1/4” seam. Backstitch at the start and end. Step 8: Clip the inside corners. Step 9: turn right side out and stuff. Step 10: Hand stitch the opening closed. 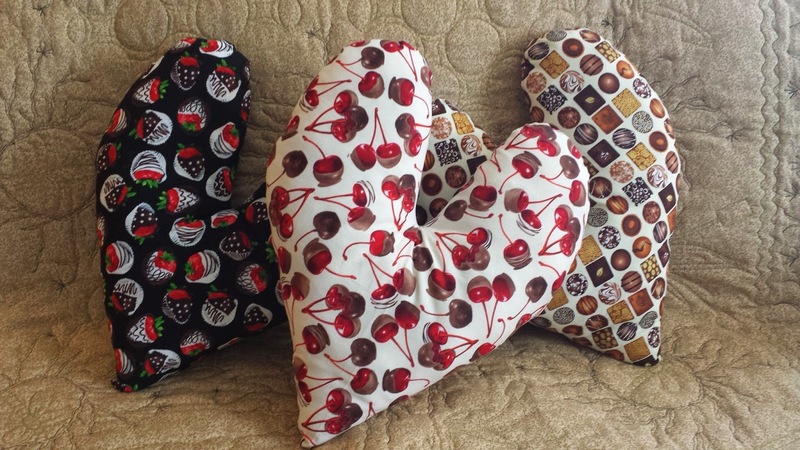 Optional Ideas: You can also use 2 Fat Quarter to create the love pillow – just place the 2 fat quarters together and start with Step 2! Thanks Stephanie and Linda! For a chance to win a fat quarter bundle of Chocoholic, make sure you're signed up to follow our blog (email and blog reader options in the right hand sidebar). Leave us a comment letting us know you are, as well as telling us what your favorite Valentine's Day treat is. The contest is open through Friday, February 13 at 11:59 pm EST. Don't miss our other Valentine's themed tutorials! Great pillow! Thanks for the free pattern. I'm already a follower via email and I like your Facebook page. Cute pillow. Thanks for sharing with all of us. Just love these tutorials. I have been a follower for a long time thru emails. Will always love strawberries. I follow with GFC - our quilt guild has made these to send on to a local cancer ward (as well as the chemo hats). I like to get my daughter (and myself) one of Lindt Chocolate Valentine boxes. You can design your own on their site and have shipped - a special treat gift. I follow via email. I am trying to avoid candy, but a few conversation hearts never hurt! I follow via e-mail. Chocolate is best but not too many. I follow via email and GFC. If I were to choose a treat for valentine's day it would be something with dark chocolate and coconut, or some chocolate dipped strawberries. I follow by email. You can never go wrong with plain chocolate. I follow by email, and chocolate, chocolate, chocolate---oh, chocolate! PS. I've made some of the breast pillows, although the pattern I was given to use was just a boring rectangle. Don't stuff them too full, just a nice squishy feel. 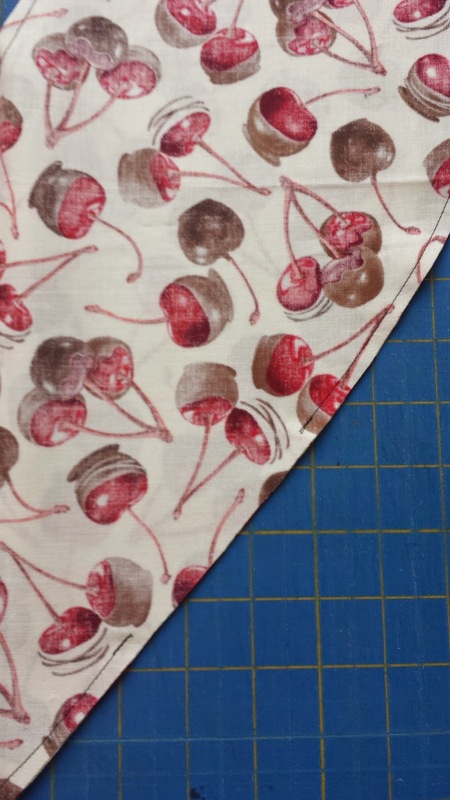 Why does this fabric make me crave something sweet? lol I love milk chocolate as a Valentine treat but flowers are very special too (and probably better for me!!) Those heart pillows are cute! Oh! I forgot to say that I am following via Bloglovin', email, and FB too!! CUTENESS!!! I follow via Bloglovin' and FB. I follow on bloglovin! Cute pillow! I'd love some Valentine's chocolates! I follow on Bloglovin & FB. I follow by email. A little chocolate is good, also colorful flowers. Cute pillow! I'm a follower via Bloglovin and GFC. Of course, I love chocolate, but I also love Peeps, which seem to be available for every season or holiday. 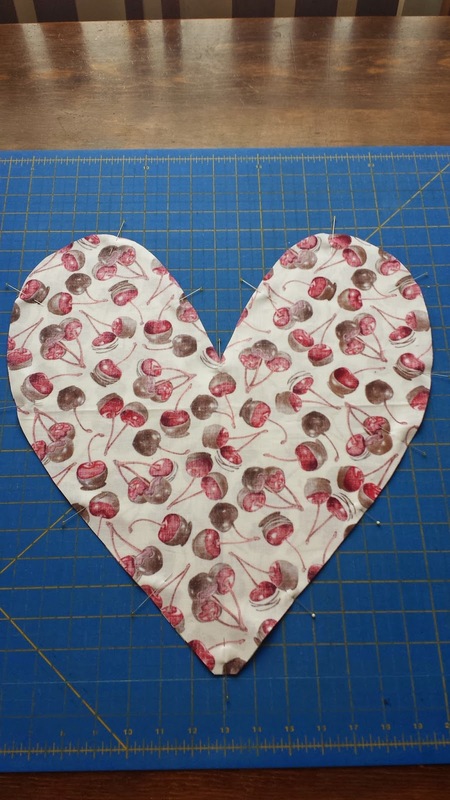 Happy Valentines Day and thanks for the chance to win this fabulous fabric! Gorgeous pillow.I follow by email. Wonderful pillow and even cuter fabric. I follow by email. My favorite valentine treat is chocolate and mint. 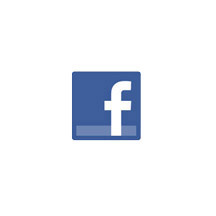 I follow via e-mail and FB. I am a chocoholic, right now I am enjoying junior mints. Love the fabric, thanks for the giveaway. I follow on Bloglovin. My favorite Valentine treat is cinnamon hearts. Thanks! I've been following via email for a long time. Always love your posts and patterns. Anything chocolate is good for me :) My daughter makes some killer filled chocolate cupcakes . . . yum! These fabrics are sooo fun!! My fave is Choclate Coverd Cherries!!! I follow your blog via e-mail. My favorite Valentine's Day treat is chocolate covered strawberries! Jewelry is always nice and then there is fabric and chocolate! I follow with Bloglovin and chocolate is my favorite treat! Chocolate covered cherries are my absolute favorite! This fabric would be a good substitute. I follow by email. Chocolate! Chocolate! Chocolate! I follow via GFC and Facebook. I follow the blog with email and GFC. My favorite treat is chocolate! I follow your blog by email. 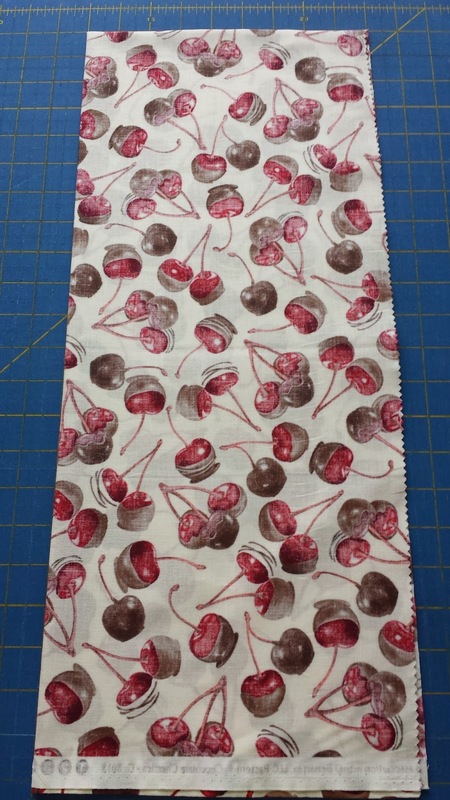 My favorite valentine's treat is chocolate, so this fabric would be perfect for me! I follow on both email & FB. Thanks so much for the pattern. Wish I'd had one of these in June! I love darkchocolate covered cherries! I follow via bloglovin. Of course chocolate, specifically See's Chocolate, is my absolute favorite Valentines day treat. I follow via email and bloglovin. My favorite treat is the little heart my dad gives me. I bake cookies or cupcakes, too. I am a Bloglovin' follower! My favorite Valentine treat is a soft sugar cookie with white frosting. Yum! Adorable projects! I follow w/ bloglovn! I love milk chocolate! I am a follower of the blog. I love having some dark chocolate for Valentine's Day. I follow via Facebook and my favorite Valentine's Day treat is truffles! Thank you for the giveaway. I follow via GFC/Bloglovin. I love a sweet card for Valentines Day. Flowers die, candy is eaten, but a card last forever. My favorite Valentine treat is chocolate covered caramels. I'm a follower of your blog with Bloglovin'. My favorite Valentine treat is anything with milk chocolate. Thanks for the great tutorial & the chance to win. I follow your blog by email. I am also a preview pack club member. My favorite Valentine treat is chocolate covered cherries. I am a follower on BL and E-mail. It's always chocolate of course. I follow as well. 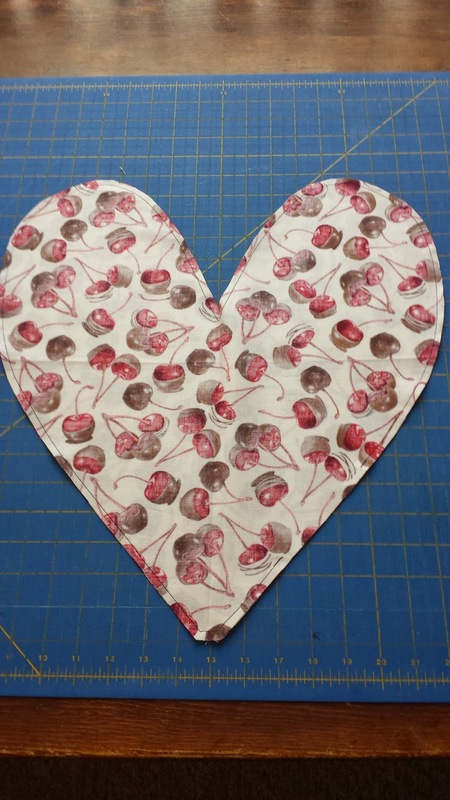 Love the Valentine's Day fabric! My favorite Valentine's Day treat is chocolate covered Strawberries ! Love the pattern. And conversation hearts. Simple and traditional but so fun! I follow the blog, the Facebook page and get the preview packs. My hubs favorite is chocolate covered bacon, but we're on weight watchers this year, so the treats will have to be experiences, not food. I follow the blog via email. And anything CHOCOLATE is my favorite Valentine's Day treat, of course! Great pillow design! I can see where it would work better than just the rectangluar pillows that we've made for those with breast cancer to use after surgery. Will definitely pass this information on to others. My favorite Valentine treat is Dove's milk chocolate truffles. They're wonderful!!! I follow the blog via e-mail. I already follow via email and FB. My favorite treat, besides fabric, is any dark chocolate. I follow thru bloglovin. My favorite treat is Dove dark choc. Yum! I receive the newsletter via email. I love sea salt caramels! I follow on Bloglovin' email and facebook. I love gorgeous flowers AND Lindor chocs. Thanks for the tutorial. Chocolate is always my favorite treat and I'm following you on Bloglovin' (Paula Lemos). Thanks for the chance! I get your emails! Chocolate kisses....my favorite! Wine is my favorite treat!